One of our favorite things here at Society Of Rock is when rockstars show a mutual respect for each other. 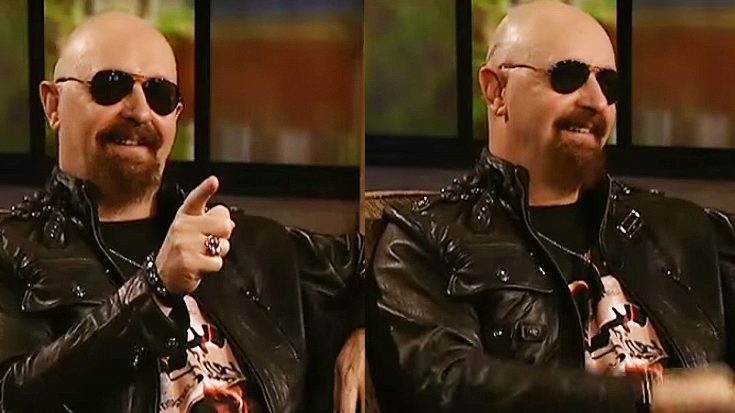 While in the middle of an Q&A session with A&E, Judas Priest lead vocalist Rob Halford was met with a great surprise when a close friend of his sent in a question in the form of a video message. Lemmy Kilmister from Motörhead sent in a video asking Halford about the method he goes about for taking care of his voice. When Lemmy shows up on the screen, a big smile comes across Halford’s face, and even though he’s wearing glasses you can tell his eyes lit up. The thing that makes this video so priceless, is that the interviewer introduces Lemmy as not just a friend, but also a fan, which speaks volumes. Halford starts his answer to the question by speaking highly of his friend, and saying that Lemmy’s voice “is rock n’ roll.” We definitely have to agree with Halford on that! When you think rock n’ roll, Lemmy almost embodied every aspect of the stereotypical image of a rockstar. As for the remainder of his answer, Halford talks about his warm-up method, and how he refrains from smoking and drinks a lot of tea to preserve his pipes.